Researchers working to create next-generation electronic systems and to understand the fundamental properties of magnetism and electronics to tackle grand challenges such as quantum computing have a new cutting-edge tool in their arsenal. 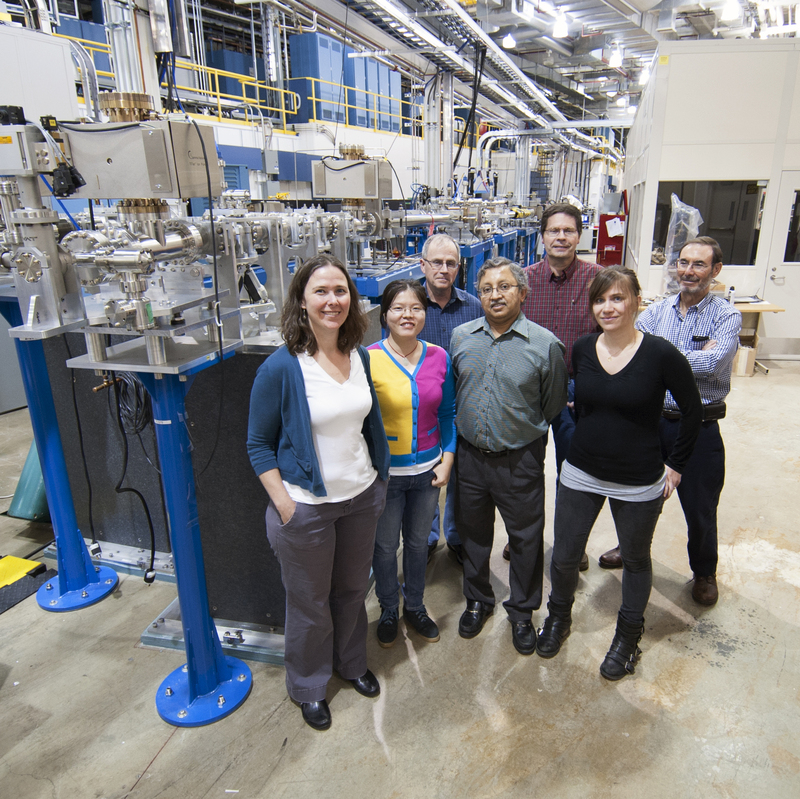 Members of the Intermediate Energy X-ray collaborative development team standing in front of the beamline. Left to right: Jessica McChesney, Yizhi Fang, Tim Roberts, Mohan Ramanathan, Mike Fisher, Fanny Rodolakis, and Ruben Reininger. The Advanced Photon Source (APS), a U.S. Department of Energy (DOE) Office of Science User Facility located at Argonne National Laboratory, recently unveiled a new capability: the Intermediate Energy X-ray (IEX) beamline at sector 29. Using relatively low-energy X-rays, the IEX beamline at the APS will help illuminate electronic ordering and emergent phenomena in ordered materials to better understand the origins of distinct electronic properties. Another important feature for users is a greater ability to adjust X-ray parameters to meet experimental needs. Currently in commissioning phase, the IEX beamline begins its first user runs in January 2016. With its state-of-the-art electromagnetic insertion device, highly adaptive X-ray optics, and compatible endstation techniques for X-ray photoelectron spectroscopy and scattering, it opens a new era for X-ray research in sciences ranging from condensed matter physics and materials science to molecular chemistry. Conventional electronics use current, or the flow of electrons, while spintronics relies on the flow of the electrons’ spins, not just their charges. Other materials that can be studied at the IEX beamline include high-temperature superconductors, magnetic materials, and polymer self-assemblies. The new beamline was built to meet the specific requirements of its two shared scientific endstations that offer users varied but complementary techniques. Using Einstein’s discovery of the photoelectric effect, the angle-resolved photoemission spectroscopy (ARPES) endstation measures the energy and angle of emitted electrons and, by using conservation of energy and momentum, can reveal what the properties of these photoemitted electrons were before they left the material. The resonant soft X-ray scattering (RSXS) uses resonance, the tuning of the X-ray beam to a specific electronic excitation, to scatter off of an ordered electronic state to determine electron density. Like the formation of a new particle in a collider, it was the research trajectory of two scientists that forged the foundations for IEX beamline. Physicists Juan Carlos Campuzano of the University of Illinois at Chicago (UIC) and Peter Abbamonte of the University of Illinois in Urbana Champaign (UIUC) both studied the complicated dynamics of high-temperature superconducting materials. By 1985, Campuzano had already proposed a similar, but less advanced, beamline at the Swiss Light Source, in Villingen, Switzerland, while Abbamonte, as a postdoc, had been on the team that pioneered the RSXS endstation, at Brookhaven National Laboratory in Upton, NY. Eventually, both took jobs within the University of Illinois system and were seeking an intermediate energy X-ray source in the Midwest to conduct their research. Given the challenges presented by these superconducting materials, they decided a better, brighter beamline was in order. They wrote a proposal that garnered funding from the National Science Foundation (NSF), which suggested they build the instrument at the newly established APS at Argonne, where Campuzano held a joint appointment. They reached out to APS beamline scientist George Srajer, now deputy associate laboratory director for Photon Sciences, to forge a partnership with DOE to fine-tune the concept and secure the remaining funding. A beamline was born. “So there was this freak convergence of a lot of different things: the right combination of science, geography, and technology all at the same time,” said Abbamonte, now professor of physics at UIUC. With several similar beamlines in Japan and Europe already operating, the toughest challenge in requesting funds for and building the new IEX beamline at the APS was to create something unique, noted Campuzano. A schematic drawing of the Intermediate Energy X-ray beamline optics, showing the source, an EM-VPU; M0 and M1, planar horizontal deflecting mirrors; M2, an internally cooled plane mirror that deflects the beam vertically onto one of the three gratings in the monochromator; M3R, a movable cylindrical mirror that horizontally focuses the source onto the RSXS sample position; M4R, a cylindrical mirror that vertically focuses the exit slit onto the RSXS sample position; and M3A (M4A), an elliptical cylinder that focuses the source (exit slit) horizontally (vertically) at the ARPES sample position. A key feature unique to IEX at the APS is the beamline’s insertion device (ID), the magnetic system responsible for shaping the properties of X-rays provided to the beamline. According to Srajer, there is no other like it in the world. The ID is an electromagnetic variable polarizing undulator (EMVPU), operating in a range of 250 to 2,500 electron volts (eV). Like a fixed magnet device, users can change the energy of the X-rays and polarization at the sample. But the new ID also allows the source to run in quasi-periodic mode, which suppresses the higher harmonics in the X-ray beamline, resulting in a much higher signal-to-noise ratio that is ideal for detecting small signals in a large background. One advantage to developing a lower-energy beamline at a high-energy storage ring is that the intensity produced by the undulator is rather flat across the whole 250- to 2500-eV energy range. This minimizes the need for normalization, unlike at lower-energy storage rings where users must switch between the different undulator harmonics. To accurately deliver the X-rays produced by the ID to the endstations required the complicated design and manufacturing of X-ray optics that precisely adjust X-ray parameters, such as focus, energy resolution, and coherence fraction. Users can further tailor the X-ray beam for a given experiment by selecting between one of three gratings in the monochromator, optimizing the total intensity or flux (109–1012 photons per second) and energy resolution (5–300 milli-electron volts [meV]). Superconductors with transition temperatures above the temperature of liquid nitrogen hold the promise of practical applications, such as the efficient production and transport of electricity. However, how those moderate- to high-temperature superconductors function is not well understood. When Campuzano and Abbamonte joined forces to develop the IEX beamline, their shared interest in high-temperature superconductivity became the focal point for the design of its two scientific endstations. Years of collective work in photoemission spectroscopy and X-ray scattering, respectively, would culminate in a powerful combination of tools located in one place. Campuzano was already using ultraviolet ARPES and was considered one of the leading experts in the field when he set his sights to building a new APS beamline. The IEX ARPES experimental station, designed and built by Campuzano’s team at UIC, uses photons in a relatively high-energy range of 1000 eV to probe electrons deeper within a solid. As electrons absorb incoming photons, they are ejected from the structure. This lets users better analyze the dynamics of electron, the electronic excitations, in a sample. By understanding what happens to the electronic structure when macroscopic properties are changed, scientists get a better idea of how they can manipulate those properties to their advantage, whether it’s finding the best remnant magnetic fields for spintronics or determining transition temperatures in superconductors. Where ARPES lets researchers know how electrons propagate in a material, the RSXS endstation lets them know where those electrons are located. Designed and built by Abbamonte’s team at UIUC, resonant soft X-ray scattering is a photon-in-photon-out technique that yields real-space information about electronic ordering and information about correlation lengths. For Abbamonte, the technique is central to his research in determining whether heterogeneity is relevant for optimizing superconductivity. In addition to the traditional microchannel plate angle-resolving detector, the RSXS endstation is equipped with a two-dimensional energy-resolving detector, another of the highly unique applications on this beamline. Considered among the most sensitive energy-resolving detectors in the world, it is based on transition-edge sensor (TES) technology pioneered by the National Institute of Standards and Technology (NIST) for cosmology applications, such as research in cosmic microwave background radiation. This is the first time TES technology has been used for scattering, and could prove 1000 times more sensitive to heterogeneity than any previous technology. The development of IEX was jointly funded by DOE and NSF.